1 city. 1 day. 7 coffees. 7 stamps. I've created a walking route that can be taken one way or the other, with spots to see along the way. Please comment below if you've managed 7 coffees in one day! On the top right corner of the Meadows is Cult Espresso, with an urban design, LEGO masterpieces, and a chill vibe to ease you out of your sleep-fog and get you ready for the day. Pick up your Disloyal 7 disloyalty card here and get stamping! Just a 2 minute walk from Cult Espresso, you'll reach Filament. It's glass storefront and funky layout is hard to miss. Inside you'll find welcoming baristas and a menu of smoothies, juices, and bagels. Get a smoothie or a bagel for breakfast (and to soak up that caffeine). Whenever I feel a cold coming on, I run to Filament for a ginger shot. You can either continue up Clerk Street as it turns into Nicolson Street and keep going until you reach Old College, or you can turn back to Buccleuch Street and pass the University of Edinburgh at Bristo Square. Both ways will take you to Brew Lab, tucked away on a side street in between Old College and Potterrow. Brew Lab is usually buzzing with students taking a break in between classes. Now you're in the heart of Old Town. If it's raining out, slip into the National Museum of Scotland on Chambers Street. It's two minutes away from Brew Lab and free-entry. If you can bare the rain, or if it's sunny (fingers crossed), walk past the museum and rub the Greyfriar's Bobby statue's wee nose for good luck. Then walk up George IV Bridge to the Royal Mile. Go left up to the Edinburgh Castle or right to St Giles Cathedral and street performances and vendors. Continue down the Royal Mile to the World's End pub and turn left to take Jeffrey Street around to East Market Street where you'll find The Arches. Among the cute shops here you'll find a cozy spot at Baba Budan. Be sure to try their homemade donuts as an appetizer before lunch. The Arches has great lunch options. For sit-down, try the Chop House beside Baba Budan or for something quick, Gannet and Guga. When you're finished with lunch, head to Princes Street by way of Waverley Bridge. Princes Street is where all the shops are, but it can also be a bit crazy with crowds depending on what time of year you are there. Take a right turn up St Andrew Street, past St Andrew Square and follow the tram tracks down to York Place where Fortitude is right on the corner. These guys make a great pour over with beans from their very own micro-roastery. If you need a serious break from coffee, I hear their hot chocolate is incredible. After Fortitude, you have a couple of options. On the corner adjacent to Fortitude is the Scottish National Portrait Gallery, holding collections dating back to the Renaissance. The Modern Portrait Exhibition is my favorite right now. Oh yeah, and it's free-entry like most of the museums are in the city! Alternatively, you could head back up St Andrew Street to St Andrew Square and over to George Street where you'll find many shops to pop your head into. Past Hanover Street is a set of stairs leading to Lowdown Coffee, where you can escape the busy streets. The shop has a very bright and modern design. 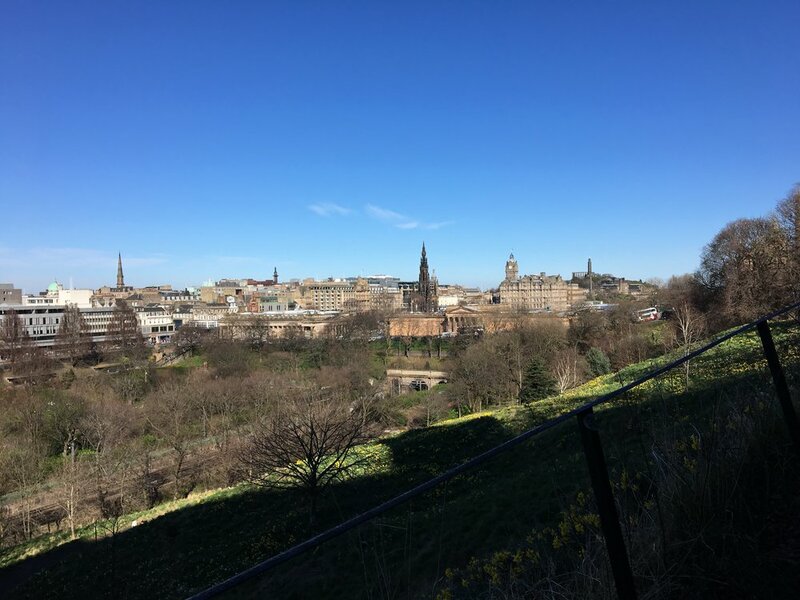 It's a great place to do work and chill at because it's quiet but, walk outside and you're right in the thick of Edinburgh. 5:00 pm - Coffee 7, the last one! There are two Cairngorm shops, one is nearby Lowdown at 41 Fredrick Street but I suggest you let coffee #6 sit in your stomach a bit and do more exploring of George Street, Rose Street, and Princes Street. During the Fringe Festival in August and Christmastime in December, George Street is taken over by patio-style restaurants, pop-up bars, and street vendors. Charlotte Square at the west end of George Street holds the Edinburgh International Book Festival with over 800 events throughout the last two weeks of August. When you're finally finished exploring New Town, keep walking towards the West End for your last cup of coffee. Cairngorm has grilled cheeses, yummy cakes and interesting specials, including a turmeric latte. It's got a beautiful open design with long tables, lots of counter space, and iPads if you feel like searching where to eat dinner afterwards. 6:00 pm - Run Free, Have Dinner, Enjoy Yourself! Congratulations, you survived the Disloyal 7. Now that you've got 7 stamps, go back to your favorite whenever you'd like for a free cup of coffee. The West End has a lot of nice restaurants and bars. If you're looking for a recommendation, I suggest Kyloe, a gourmet steak restaurant at the Rutland Hotel. For drinks, try Indigo Yard. *If you want to split this up into two days, it's easy—hit all the New Town cafes one day and the Old Town cafes the next day or vice versa. I did a Disloyal 7 coffee crawl in one day with my friends and we were all a bit kooky by the end of it. (I could only manage wee sips of coffee at the last few shops since my body isn't used to that much caffeine.) It was a really fun experience and all of the photos on this page were taken by my friend Flora, so all credit goes to her. Thank you Flora! Please, please, please comment below if you've managed 7 coffees in one day. You need a congratulations! Why A Creative Writing PhD?